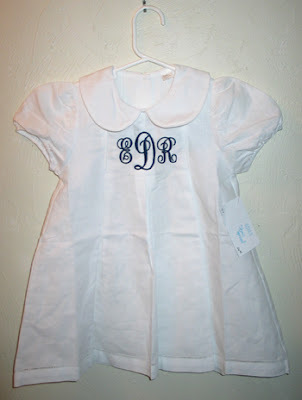 Carla bought this sweet white dress and asked me to monogram it for Ella. I was very hesitant at first due to the tuck across the center, right where the D would be stitched. Carla must have had more confidence than me because she told me to go ahead and try! I held my breath and it stitched out very well. Whew!! 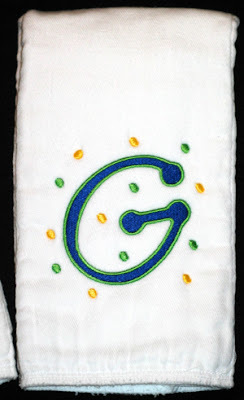 Here's a close up of the monogram (and the tucks). 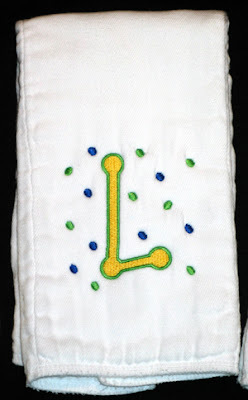 I used Monogram KK, a freebie on SewCrazie's yahoo group. 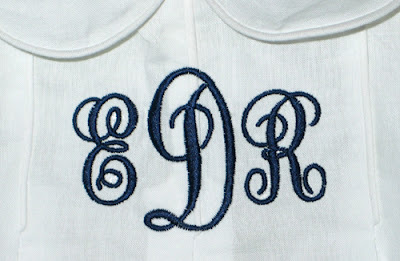 The center letter is actually her small letter (2.5") and I resized the E and R down to make it work. They resized well! What a great summery dress. I look forward to seeing sweet Ella in it! 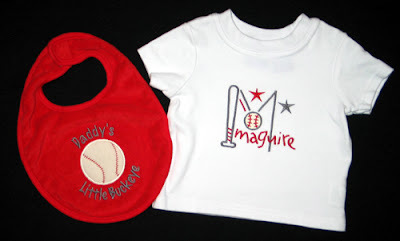 Baby Gift Set for sports fans! 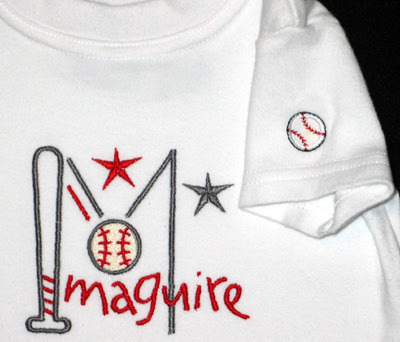 The applique baseball on the bib came a baseball sucker holder designs from Embroidery Garden (a freebie on her yahoo group) and I added the text with Embird Alphabet #8. This little white shirt was in my stash. 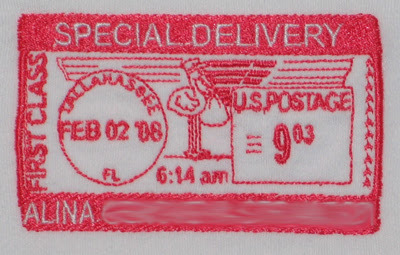 It already had a tiny baseball on one sleeve. I was saving it for an occasion just like this. 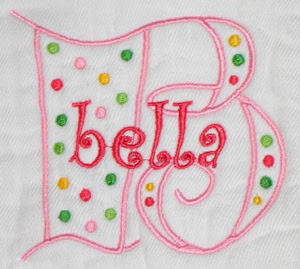 The monogram that I added to the front is part of an adorable set from Five Star Fonts. Daisha even brought her camera so that she could take a picture of us together. How thoughtful! 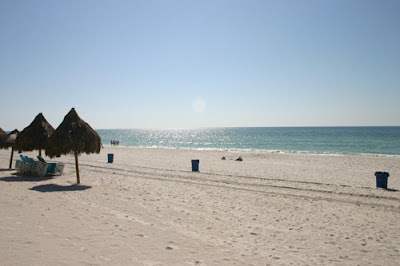 Don't expect any more blog entries for a couple days... my machine is ill again. I discovered what I did wrong back in August when I "broke" it -- Unfortunately I did it again on Saturday. At least this time I know what is wrong and that it will be a quick, relatively inexpensive repair. Just an inconvenience -- I have to drive to Moutrie, GA. But hopefully I have learned my lesson for good and it won't happen again! Sara's baby shower was Sunday. 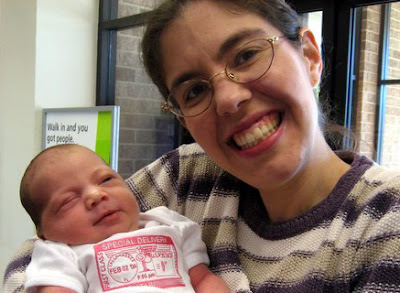 She is expecting a girl, but they haven't settled on a name. Whew! That sure relieved the pressure to quickly stitch another full gift set! 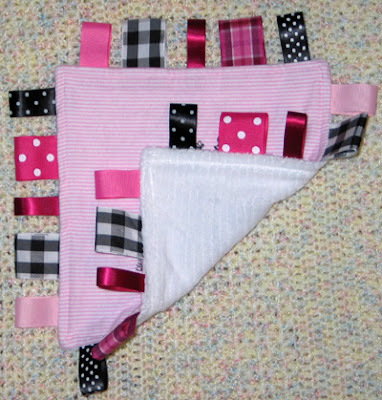 :) I plan to make her two personalized burp cloths and a pacifier clip after her daughter is born, but I really wanted her to open something at the shower, so I made her this ribbon blankie. 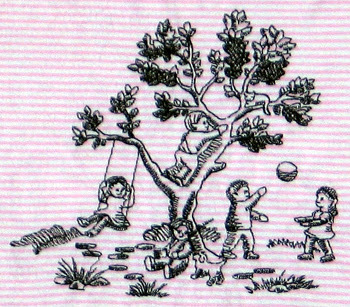 and stitched it on pink/white striped flannel. 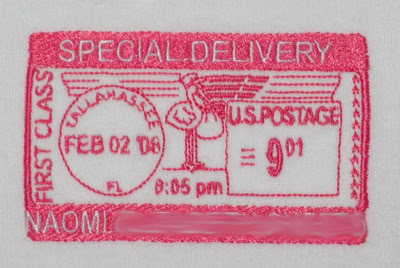 The back is white minkee and there are an assortment of black/white and pink ribbons around the edges. Anyway, I was all prepared to crank these things out as soon as I got back, but then I got a head cold. 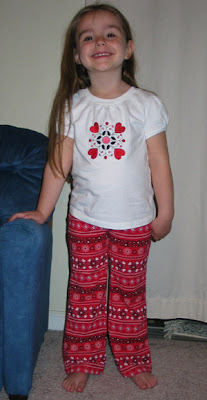 It took a while to muster up the concentration needed to sit at my embroidery machine and stitch them out. Then the rest of my family got the stomach flu... Since I didn't want to deliver the onesies while sick/contagious I asked a friend to do it for me. So a little late... but here they are. Alrighty, these are a little over the top. I got them done in time, and everyone liked them, so I guess it was worth it. But had I realized how much time I would invest in them, I might not have done them in the first place! The designs came from ZippyDesignZ. It's an in-hoop project, much like the crayon rolls. 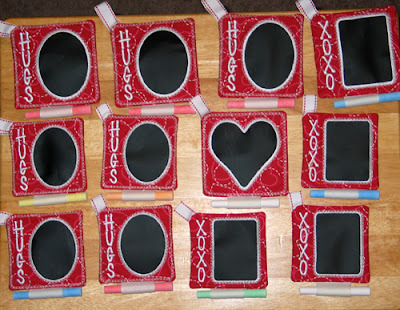 The applique is a vinyl chalkboard material that you can write on and erase just like a chalkboard. 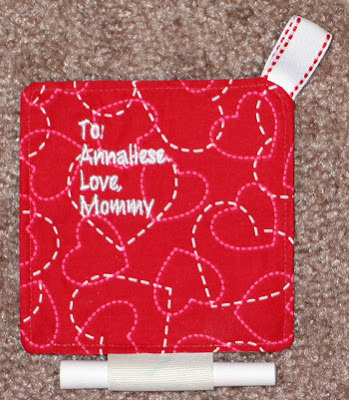 When I showed Annaliese was I was planning to do, she quickly decided (without being asked, I might add) that the girls would get the ovals, the boys would get the rectangles and she would get the heart. :) I'm glad she's a better decision maker than I am! I started stitching the ones for her classmates first. Even though I knew the dimensions, they still turned out smaller than I expected. So I decided to enlarge the designs to fill my hoop (a little bigger than the average 4x4 hoop). I definitely like the bigger size -- those four went to some of her pals in other classrooms. Then I cut them apart, and voila! Four backs in one hooping! This step took extra effort and time, but definitely worth it. 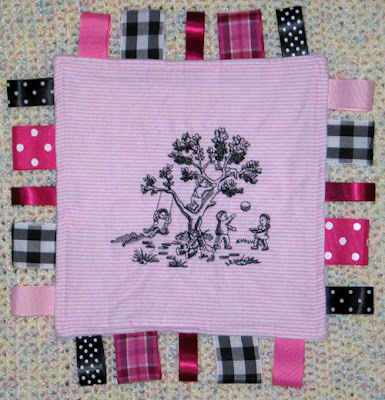 The design calls for the loop of ribbon at the top as a hanger or holder. 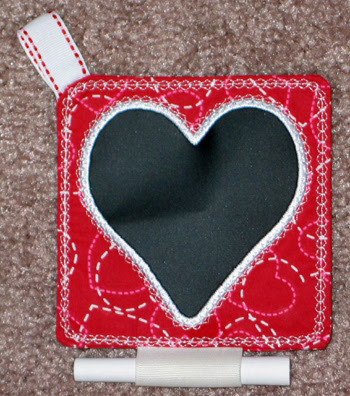 I decided to add the loop of ribbon at the bottom as I stitched it shut to serve as a chalk holder. Well, I didn't get them done by February 1, but at least they are done before Valentine's Day! 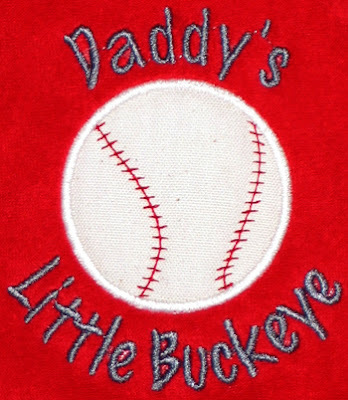 In a previous post I shared that I had digitized a design to match leggings that Valerie has purchased for Annaliese, Kylie and Kenzie. 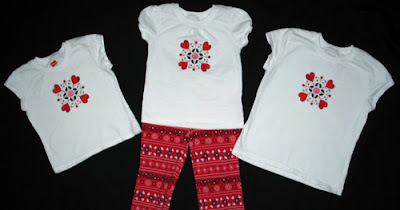 I was able to do a test stitch on Tuesday, but wasn't able to actually stitch the shirts until this weekend. I did one last night and two this afternoon. They are washed and ready to be worn! Hopefully I'll be able to get a group shot... look for an update at some point over the next week! 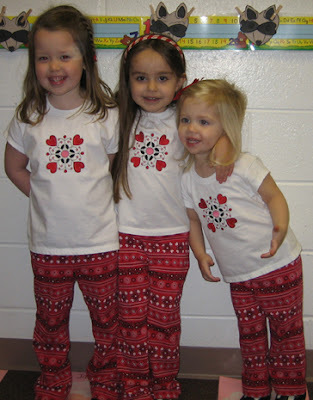 UPDATE: Here's a picture of the three of them at Preschool during the Valentine's Day party. Aren't they cute?? "This is not beer." apparently the natives wonder what the Americans are drinking. This is to clear things up. :) I used Embird Alphabet #2. 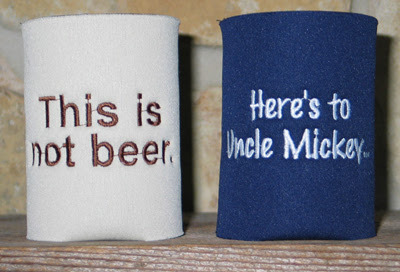 "Here's to Uncle Mickey..." I have no idea what this means. Just an inside joke that AJ would appreciate. I used Embird Alphabet #8. Tiffany said, "Aaron received his Valentine's Day package the other day and called me up laughing hysterically about the koozies. He thought they were just wonderful and the khaki and brown one nearly put him into hysterics. He said the colors were absolutely perfect because they match his desert camoflague uniform and that the other guys all got the biggest kick out of it, too. So thank you! That made for a wonderful care package!" That's the best part about being able to do this -- gifts that are perfectly personalized. 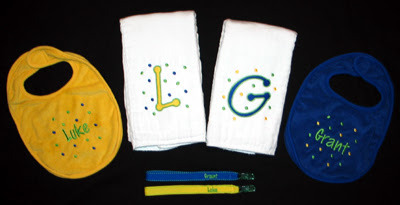 Monograms are great and all, but being able to make creative gifts that are thoughtful and truly appreciated by the receiver, bringing joy to all... what fun!! 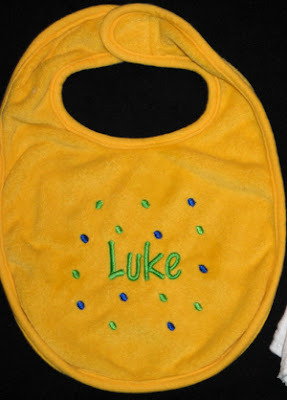 I also had blue and yellow bibs, so I knew this was the route to go! The names were added with Embird Alphabet #8. 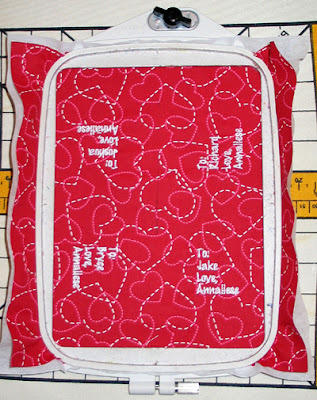 The big monograms are from the Tinker Toy font that were originally posted on SewForum, now available on sewcrazie's yahoo group. 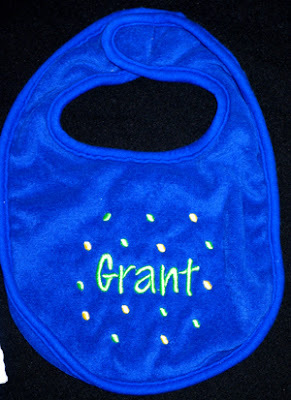 Grant gets blue with yellow and green accents, Luke gets yellow with blue and green accents. 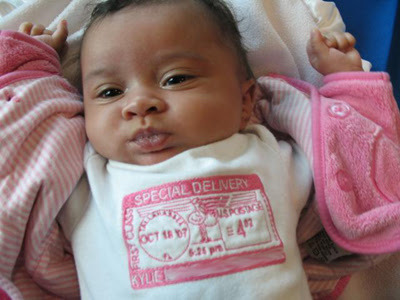 Sabrina and her team at school ordered a gift set for a baby shower that was held today. 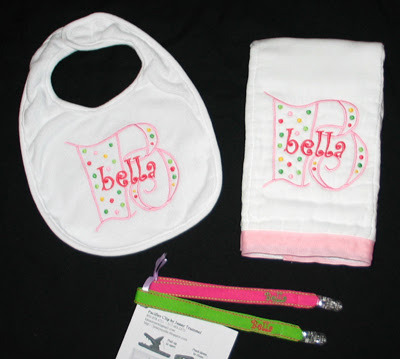 Baby Bella and mom received two pacifier clips, a bib and burp cloth. I really like the color combination on this set! Hey folks, sorry it has been so long. I got two wisdom teeth pulled Friday 1/25, and it took me longer to recover than I expected. 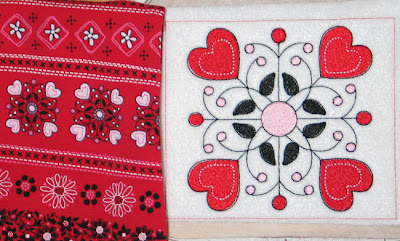 The pain meds they prescribed made me feel loopy enough that I didn't trust myself with the embroidery machine. And by the time I went to regular Advil, I left for the women's retreat with our church. So anticipate lots of posts in the next few days. First up, a birthday gift. Annaliese was invited to Savanah's 4th birthday party. She couldn't attend since it was the day I got my teeth pulled, but we sent a gift none the less. 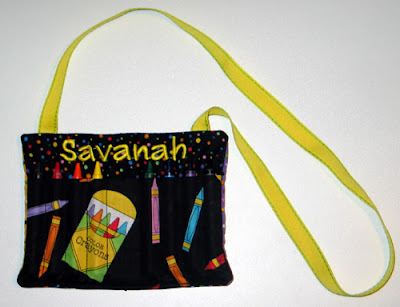 I made a crayon purse for her, similar to Annaliese's and Siena's. 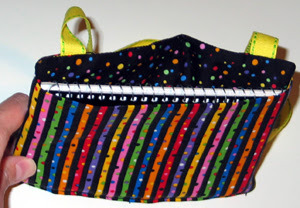 This time I used the crayon fabric on the side with the crayons and the stripes on the pocket. I think I like it even better! The text was added with Embird Alphabet #8, but at a different aspect ratio so I could make the name longer without being too tall.